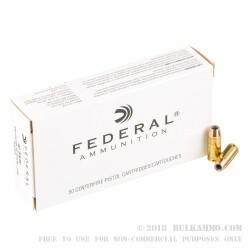 Federal’s classic Hi-Shok line is a proven, well-made hollow point cartridge at a great price. 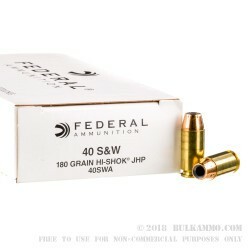 This .40 S&W ammo is ideal for testing the proper operation of JHP ammunition in your firearm. The heavy 180-grain bullet achieves a muzzle velocity of 1,000 feet per second and produces decent expansion. 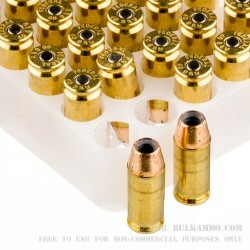 Each box holds 50 cartridges in Boxer-primed reloadable brass cases. Shooters looking for carry ammunition may also want to consider HST, Federal’s latest line of personal protection cartridges. 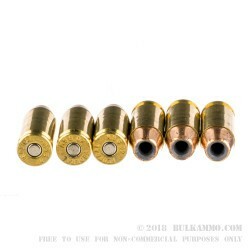 An innovator in the ammunition business since its founding in 1922, Federal Premium Ammunition manufactures many well-regarded ammo products including the new Fusion hunting series as well as the HST and Hydra-Shok self-defense cartridges and Lake City mil-spec ammunition for AR shooters and the US military. The company’s main production facility in Anoka, Minnesota covers 175 acres and employs a team of over a thousand people with extensive expertise in manufacturing accurate, reliable ammo. Great ammo, great price! Ships very fast.